I got tagged by Emila with this unique peace tag; the main purpose is to spread peace and unity around the globe. 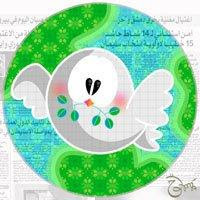 Emila's friend, Zari created the beautiful dove icon you see here, as a symbol of unity, love and peace. I think this tag is a wonderful way for us bloggers to help spread peace and love to each other. If everyone does their part in maintaining peace within themselves, their families, society and eventually the world, I'd like to believe that love will take over and peace will hopefully reside. And now, lets tag some of my blog friends who I think have lots of love to share with others and they are Bobby, Madamoiselle, LJ, Zubli, Farah, Hazel, Bokjae, NAFASg, Sassy, Jamy and Catsy. Will you join me in this quest to make love and not war? 1. If you get tagged or not (and want to play along), take some minutes to meditate about love and peace, pray for countries that are facing troubles, for those people you love and those you don’t. 2. Write a post with links to blogs that you think would like to participate. Haha! a slogan of the hippies era! Will do it soon! I remember during that era, my long hair! The symbol, make peace not war. This is an interesting meme, it shouts, make love, okay, I love it, not war. Of course, why war? Making love is good. LOL!!! Phoebe, mesti tak faham cakap orang tua-tua gini! GP! I love this test!!.. I scored 65 too...yihaa... what a fun site... thanks for sharing dearie!! Well, the first thought and impression that I give you is about sending love and peace. That's good and its true. Its truly the Jamy!!! I have placed my latest long hair face version 235, for Phoebe to see a groovy Uncle. Love memes, thank you your highness, i love this "Make love not war" thingy hahaha...I'll post it soon. p.s: Thanx for the kit kat. Can you send me the real one now? ;p hehehe.. Yes, I will do this! I am working at a new job so I am much busier than ever! I need a vacation already:) Thanks Marzie!!! This is wonderful! A peace tag. We are very honored that u tagged us to help spread the word of love and peace. done! thanks GP, i love this. hello Mariuca! glad to meet you and your blog!